A bear of a player with the delicacy of a violinist - that's how one onlooker once eloquently described Graeme Souness. It fitted the bill perfectly, for here was a fearless midfield general who, despite a reputation as a hard man, possessed the most subtle of touches. Souness helped bring 15 major trophies to Anfield in his six years at the club, and remains one of just four Reds captains to lift the European Cup. A native of Edinburgh, Souey started out at Spurs but it wasn't until he moved to Middlesbrough in 1973 that he really made a name for himself. Such was his precocious talent that it took £350,000 for Bob Paisley to secure his services in January 1978, at the time a record fee between two English clubs. The midfielder's impact was instant, scoring a thunderbolt against Man Utd in front of the Anfield Road on just his second home appearance. It was one of the finest first-time strikes you are ever likely to see. Souness quickly replaced the ageing Ian Callaghan in the heart of Liverpool's midfield and, just five months after his arrival, was instrumental as Paisley's men made history by retaining the European Cup. It was his precision pass that set up Kenny Dalglish for the winning goal in the Wembley final. The influence the Scot exerted on the team grew with each passing season, and in January 1982 he had the honour of becoming club captain. It was in the wake of a dismal Boxing Day defeat at home to Manchester City that Liverpool slumped to 12th in the table and Paisley shook things up by asking Souness to take possession of the armband from Phil Thompson. Five months later the Championship pennant was once again flying high outside Anfield, while the Milk Cup sat comfortably in the trophy room. Away from the game, his liking for the good things in life, including the odd glass of bubbly, earned Souness the soubriquet 'Champagne Charlie'. This was in stark contrast to his image on the field, however, where nothing could disguise the fact he was a ruthless competitor with a steely determination to win at all costs. No opposition crowd, however hostile, could faze his ice-cool temperament, while no opposing player would escape without retribution after committing a misdemeanor against his Liverpool teammates. The more intimidating the atmosphere, the better he performed - a fact never better illustrated than during the climax to the 1984 European Cup campaign. In the semi-final second leg against Dinamo Bucharest, Souey was targeted by the Romanian crowd following an incident in the first leg that left a Dinamo player with a broken jaw. But, with every boo, whistle and jeer, the Reds skipper grew in stature and orchestrated proceedings as a place in the final was memorably secured. Having already scored the winning goal which once again clinched the Milk Cup, and having lifted a third successive league title, an unprecedented treble was now on the cards. Only AS Roma stood in the way – though, as luck would have it, the Italians would be playing on their home turf. But who better to lead Liverpool into the lion's den of the Olympic Stadium than Souness? With a frenzied home crowd baying for blood, he boldly led his colleagues on a pre-match walkabout that sent confidence in the red camp soaring and planted the first seeds of doubt in the minds of the previously ultra-positive Roma fans. 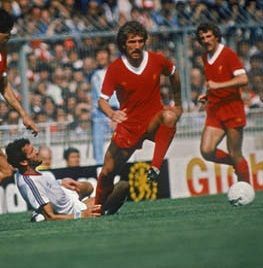 A couple of hours later Souey was deservedly basking in the glory of his finest moment in a Liverpool shirt after inspiring the Reds to a fourth European Cup triumph against all the odds. Leading by example, he netted from the spot in the never-to-be-forgotten shoot-out victory. Little did anyone know that hoisting the giant trophy aloft was to be his last act as a Kop hero. That summer, after months of speculation, he opted to try his luck abroad, leaving for the land of the lira in a £650,000 move to Sampdoria. At the peak of his powers, the 'Emperor of Anfield' was regarded as the most complete midfielder in the game, and it would take Liverpool some time to find an adequate replacement. Souey will always be considered an automatic choice whenever any all-time Reds XI is discussed. Even his unsuccessful spell as manager cannot change that.